I’ve slowly returned to a ‘normal’ pace of life after completing the third of my races in France this year, which I had billed as my ‘French Triple’. First up was the Paris Marathon. Secondly, the biggest race in my 2014 calendar – Ironman Nice. Finally, eight days ago I completed l’etape du Tour, starting in Pau going up and down the Tourmalet and finishing at the top of Hautaucam in the Pyrenees. Only three weeks after the Ironman, I had done some specific cycle training but was mainly just ticking over and keeping my legs strong. 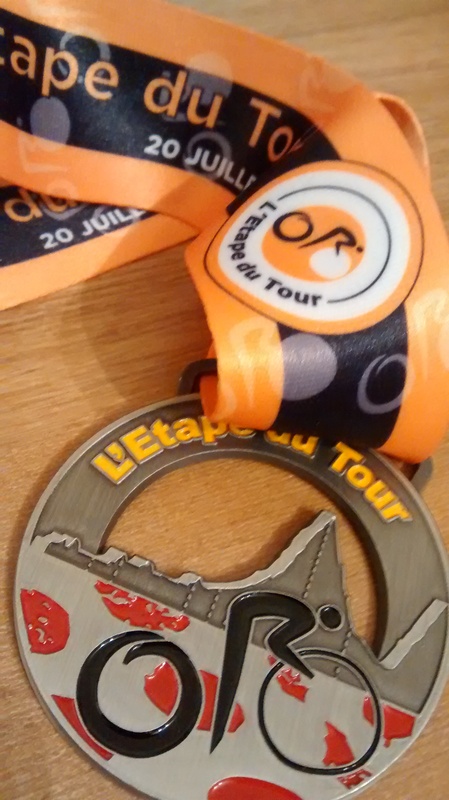 I had wanted to do l’etape for the last eight years, and I think I did myself proud. The weather was not favourable – thunder storms and heavy rain left riders miserably cold and made the descents more dangerous than they already were. For me, the highlights were the French crowds – it’s a pleasure to cycle and race somewhere where people are so keen to cheer you on. From the family singing “Allez, Allez, Montez La Tourmalet” (Go, Go, climb the Tourmalet) near the top of the Tourmalet, to the girls in the first village we got to whilst descending the Tourmalet who were handing out newspapers for riders to stuff in their jerseys to stay warm, and of course the thousands of other spectators who lined the route, it was most memorable. The lowlights were definitely the cold and the pain in my lower back. My lower back pain was most likely caused by not doing enough long hill climbs in training – during the race it hurt so much that I would occasionally stop for just ten seconds to be able to think straight before continuing again. But the hardest part of the race for me was the one thing that managed to drown out my lower back pain – the descent of the Tourmalet. I was so cold and wet I was trying to brake to slow down, but my fingers were numb and struggling to keep on the brakes. At one point I pulled into a lean-to shelter to wring out my jersey and to put all my layers on, and I came across about five racers who were shivering and in a bad way. One even asked if I would like to huddle together with them for warmth, at which point I thought it was my cue to leave! Careening down the mountain, I was shivering so much I was causing the bike to shake too, which was a tad disconcerting in the wet, cornering at over 30mph. Did I enjoy myself? For the majority of the ride, yes. I knew I could do it, but perhaps this latest episode of cyclist whilst shivering uncontrollably was a bit too close to the last episode. On the flats and on some of the climbs I aced it. When I finally got to the top of Hautaucam, I did feel good about myself and even managed a sprint finish to stave off another rider. I finished in a respectable time and managed to keep myself and my bike in one piece. The caliber of the riders around me exceeded that of the average local sportive. The race organisation, feed stations, Mavic support vehicles, event village and pasta party were all well thought out and made for an enjoyable weekend. For proficient keen cyclists, l’etape has to be high up the list of rides to do at least once!